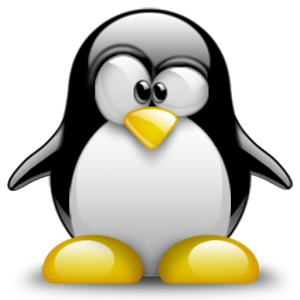 I spent hours trying to install Linux on one of my laptops. When I finally got that done I spent hours trying to port The Superfluous to Linux. Then I spent more hours trying to get it correctly uploaded to Steam. It was about 3 am when I was done, but I was done. The Superfluous is now on Steam and available for Linux! Well the title says it all. We are live on Steam. It has been a long road to get here. I've basically reach a personal goal for myself with this game. I've become a professional indie developer? I don't know, maybe. I've been making games for a really long time. Most no one will ever play because they are simply bad. Others because I never finished them. I plan on adding things to the game in the next couple of months. I've already have an idea for my next game. It will be bigger in scope and I think will reach a wider audience. Let's face it, platform games do not appeal to many people. I really am thinking of a way to tie in The Superfluous and my new game lore wise. I think it might be a neat thing to see my games be in the same universe (much like a good sci writer would do). I've mainly been working on some really boring UI and behind the screen optimization stuff the last month or two. 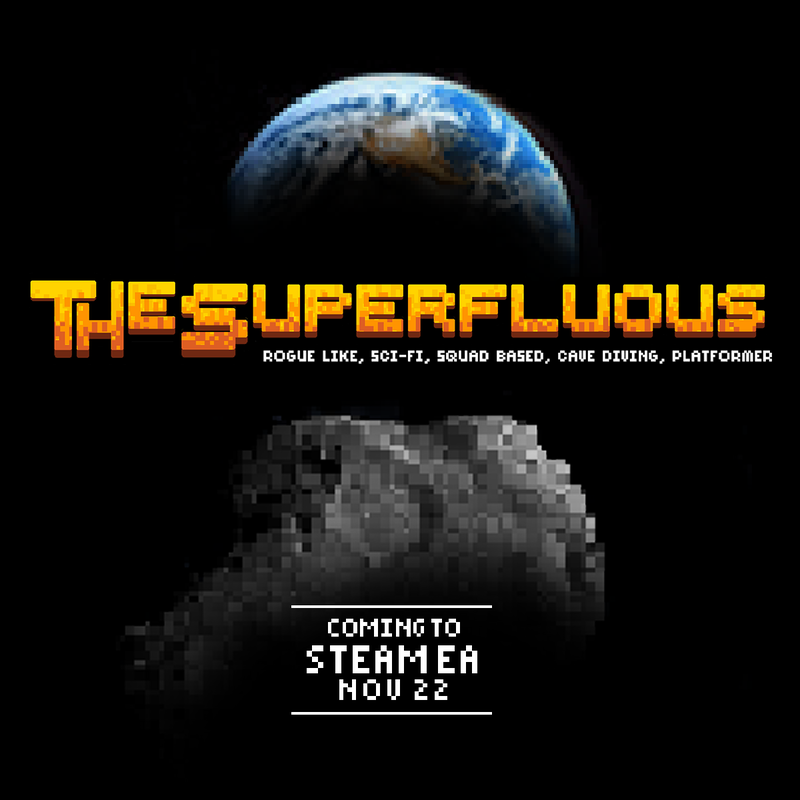 I released The Superfluous in Early Access on Steam back on Novemeber 22nd. I had the first 1/3 of the story written and it's biome fully laid out. I worked on the Worm Boss next. I also decided to add these as little enemies through out the first biome. The worm boss (while derivitive) works really well. If you destroy a middle segment you are left with two bosses to fight instead of one. I also decided that the boss worm would destroy the blocks it tunneled through. This goes with the lore that the worms created the many caverns and caves found in the game. This boss also went with a core idea I have: each weapon should have strengths and weaknesses. The laser is the best for the worm because it will penatrate and damage all the sections at once. I found myself relying on the assualt rilfe a lot through out the first biome and I wanted the feeling that different weapons worked better for different situations. Speaking of weapons I also created a flame thrower. It is pretty awesome. Along with some major engine tweaks (the engine I based this game on has been edited so much is it almost unrecognizable) I added a few more options. I created the much requested keyboard rebinding and the RStick on the controller will now shoot. The RStick firing feels a little wierd to me, but some people liked it better. I guess I come from the era of console/controller gaming where using buttons (ABXY) felt normal. Today dual sticks are used for shooters so this generation of gamers are more comfortable using those instead of buttons (I still prefer my mouse and keyboard). It is interesting that FPS games have changed how we use buttons. I Humble Store page is live! It is marked coming soon. More on the release date next week. A Sneek Peek at Our Next game? I've had some down time waiting for other people to approve projects and I was at sort of a dead point where I couldn't work on things until other things happened. So I spent a day or two working with some of the new pixel art I've been animating. I created a game called "The Kings Of Limbo". Check it out below and let me know what you think. Should this be the next game we make? ​We have a coming soon page up now on Steam! We've been accepted to be on the Humble store. Which is big news! 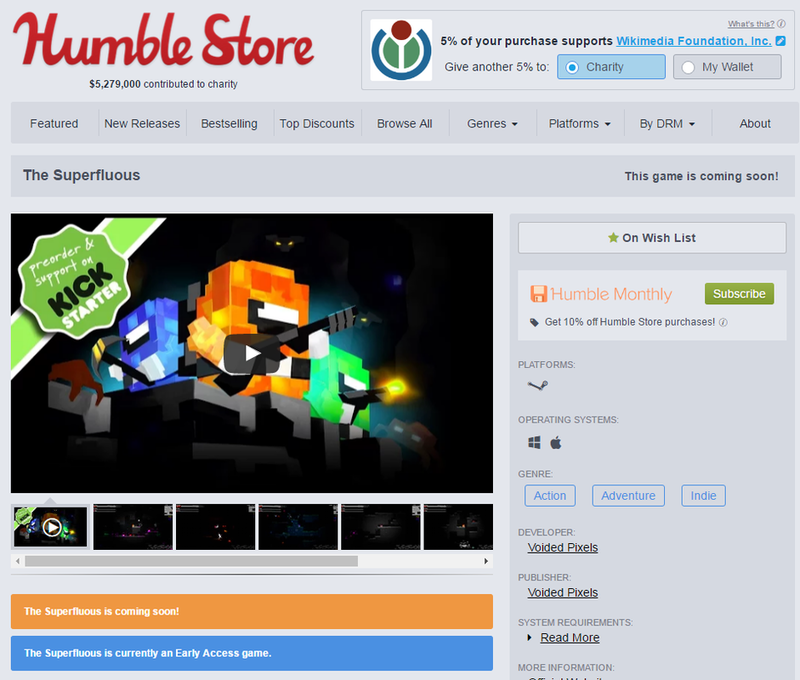 The Humble Store is one of the largest markets for Indie Games. Hopefully we will be put into a bundle sometime down the road. Also work on the Steam side of things are coming to a close. We are almost ready to post the game as "UPCOMING". We will keep you guys posted. We've updated out itch.io page now with the most recent version of the game. This will be our DRM free version. This is the link if anyone missed out buying the game and want to do it now. Steam keys will be available to buyers after we release it to Steam. I got an email today at 10:50 that said "The Superfluous" has been Greenlit by Steam. For those that don't know much about the PC Gaming market this is huge news. Steam is the largest PC game distributor in the world. Being Greenlit means that I'll be able to sell "The Superfluous" on Steam. 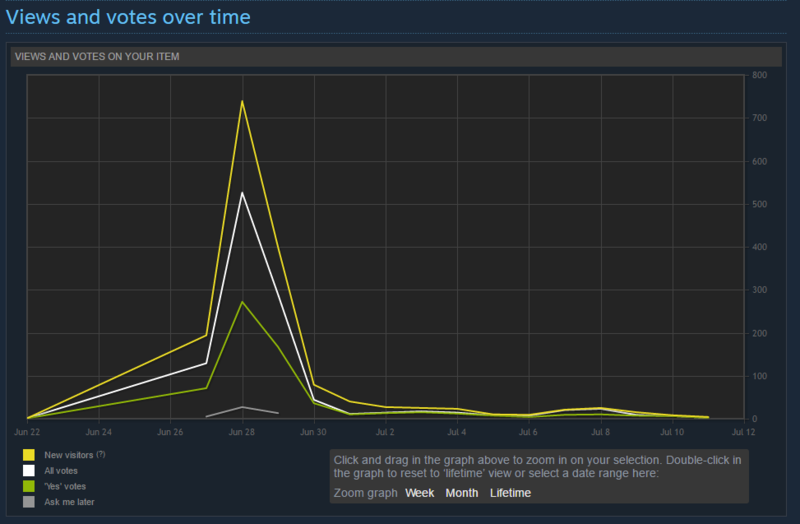 Selling a game on Steam has been one of my biggest dreams. Reaching this milestone is really beyond exciting. The process has been super stressful and I am sure my family will be happy to have me become closer to my normal self. Below I'll post my stats for the game. I've seen a lot of games relying on less than ethical means to reach their Greenlight goal. Basically this means promising a Steam key if they vote Yes on their project. I don't really get this though. 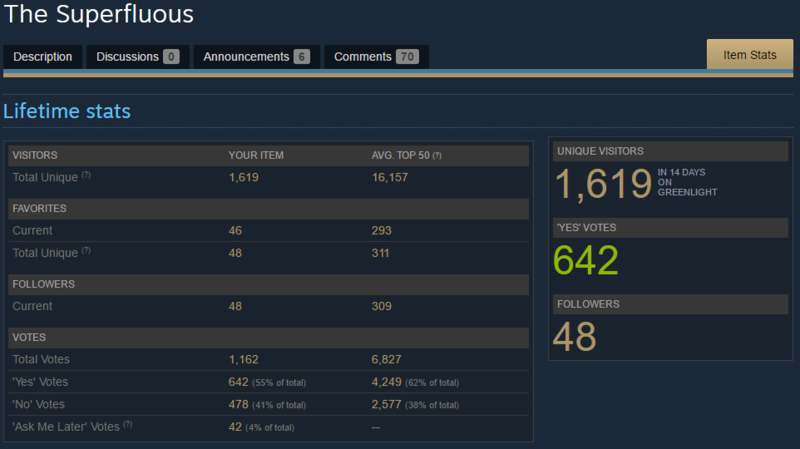 It doesn't reflect how good your game is and makes it harder for Steam to pick good games to Greenlight. Also it reduces the amount of money the game generates. So it is a lose for the community and a lose for the developer (if it's a good game). Here are the stats. These are really only useful for other developers.